The Commander of Combined Maritime Forces’ anti-piracy task force met with the Commandant of the Djibouti Coast Guard recently to talk about the regional security situation. Commander, Combined Task Force 151 (CTF 151), Pakistan’s Commodore Muhammad Ihsan Qadir, called on Lieutenant Colonel Wais O. Bogoreh at the Djibouti Coast Guard Headquarters. 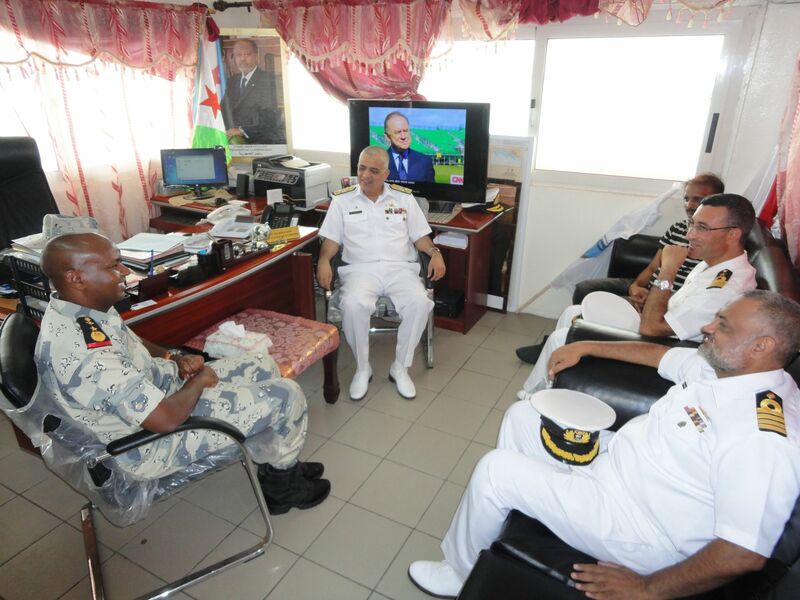 Lieutenant Colonel Wais O.Bogoreh (left), Commodore Muhammad Ihsan Qadir SI (M) (center), Captain Khalid Pervez (closest right) and Commander Ahmet Gül (middle right) meet at the Djibouti Coast Guard Headquarters. The Djibouti Coast Guard is responsible for maritime security and law enforcement along the coast of Djibouti, including the Port of Djibouti. The Port of Djibouti is a critical harbor that permits counter-piracy warships and other vessels to refuel and resupply without sailing far from the internationally recommended transit corridor (IRTC) in the Gulf of Aden. As such, this meeting provided the Commodore and the Commandant with an opportunity to talk about the maritime security situation in Djibouti and the surrounding area. Lieutenant Colonel O.Bogoreh explained that his primary challenge is to ensure that his assets are properly deployed along the entire coastline. He also explained that while he felt that smuggling was the greatest maritime law enforcement threat faced by Djibouti at present, he is aware of the threat posed by piracy. As a result, his ships constantly patrol the waters around Djibouti to counter pirate activity.